I know it is summer and it is definitely not the time for soups, but it seems that Mother Nature cannot make her mind up! It was actually hailing last week and it certainly was fresh! So I did feel like some soup after coming back from that weather! I am still posting it … am pretty sure that it will come in handy when the weather changes again! In a large stock pot, heat some oil, add the onion, carrot, celery, garlic and rosemary and cook, stirring occasionally, until the vegetables start to soften. Add the tomato paste, pinch sugar, tomato pulp, bay leaf, chilli and stock. Season with salt and pepper and bring to a boil. Reduce the heat and simmer for about 10 minutes. Add the brown rice and after another 10 minutes add the chickpeas. 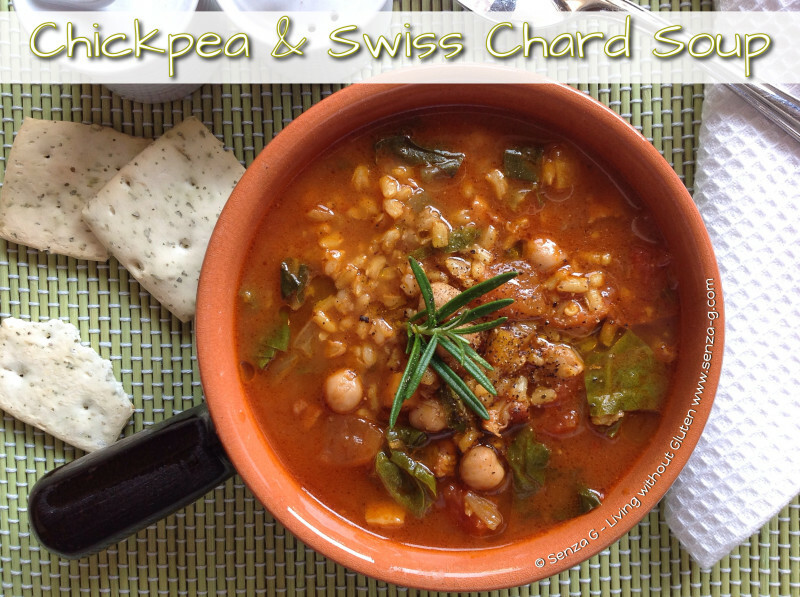 Cook for a futher 5 minutes and add the Swiss Chard to the soup. Simmer until the chard is tender and the rice is cooked. Serve garnished with rosemary sprigs, and oh when the weather gets fresh again!